Night dive with manta rays in Hawaii ... Caught on film is the repeated approach of a bottlenose dolphin toward the divers, who finally realize that its pectoral fin is entwined in fishing line. The dolphin is literally asking for help! It takes a little while for diver Keller Laros to work out the hook and cut the line, but the dolphin is as cooperative as can be. Pretty amazing video, especially this part: "I signal the dolphin to come over ..." Wow! September 2013: Animal Planet again airs a 3-hour "documentary" on bipeds (that means us) that broke off from our human precursors to enter the sea and evolve in its depths, forming an alliance with dolphins and developing tools to procure food with. Titled "Mermaids: The Body Found" and "Mermaids: The New Evidence," we learn that a white shark in South Africa had been caught with a mangled corpse inside it that, when examined by a team of NOAA researchers, turned out to have hands, an acoustic "blowhole" in its forehead, a weight-bearing pelvis, femurs, and was ... a mermaid! Handily (but a bummer for the researchers), the South African government confiscated the mermaid's remains, claiming them to be of national importance to South Africa, and thus the NOAA researchers returned home with absolutely nothing. 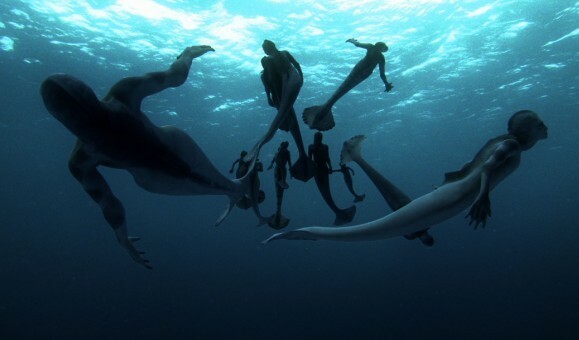 The film is interspersed with animations of these zippy mermaids as they are tracked over enormous periods of time (6.5 million years ago to the present), cavorting in the waves with their dolphin friends and retreating to deep caves to avoid Megaladon (if I got it right) -- the ancestor of the modern great white. Because land-living humans have a flexible spine and can hold their breath for up to 20 minutes, we demonstrate a capacity to swim and dive unlike other mammals (all this is true). Our art from all over the world -- ancient and new -- depicts creatures that are half-fish, half-man; therefore, suggests Animal Planet, who is to say that such creatures aren't somewhere out there in the deep blue? What's striking is that so many people fell for this show and its actor researchers (admitted in small print by the producers), even though the CGI was so cheesy and it was unclear whether the mermen (you would have to call them this in keeping with terminology) were warm- or cold-blooded, how they breathed and reproduced, and a lot more. Women, especially, love mermaids and collect all kinds of mermaid memorabilia. Animal Planet's tag line is "surprisingly human," and many of its shows endearingly portray our furry and feathered friends. The script of this particular special was powerfully written to evoke sympathy: with the many "Dr.s" interviewed (supposed Ph.Ds) who struggled against our Navy for the "truth" and the lost species itself, depicted repeatedly by a feebly moving webbed hand poking from under a pile of sand. One plus for the show was alerting us to Navy sonar/warfare testing that may well be the reason so many species are beaching themselves, in many instances deaf, and with blood seeping from their bodies. Writes shark specialist David Shiffman, who was very annoyed by the program (comments edited for brevity): "Many of my non-scientist friends ask me why it matters if people believe in mermaids. It matters because the ocean is extremely important. Many marine resources are being over-exploited and mismanaged,leaving us in serious danger of losing them forever. If you are so ignorant about what is really happening in the ocean that you believe that there are organisms that are half human and half fish, you're almost certainly unaware of the important problems." Continue reading here for a great summary of what we should be worried about (not mermaids!). June 2013: It was only a day ago that a friend ran up to me at the beach to tell me about "this woman who swims with great whites, holding on to their fins." A free diver himself, he ran back home to get the magazine in which he had read about her (Pacific San Diego). "You even look alike," he said. "You could be cousins." Well, I was in shock at such a compliment when I opened the issue to see this absolutely beautiful woman standing shoulder deep in water against a sunset, evidently also the Shark Whisperer he was talking about. (I wouldn't say we look alike, but that is not the point here.) Ocean Ramsey grew up in San Diego, trained at Sea World, worked at the Dive Locker in P.B. (around the corner from my optometrist), and has since become a worldwide phenomenon with her very own amazing sense and understanding of the shark world. They're more like cats or birds, she says ... just not really interested in humans. This is an unusual and helpful insight/observation that should put a lot of nervous nellies at ease, as well as her opinion (based on experience) that sharks can tell the difference between fish blood and human blood in the water -- and the latter is not at all to their taste. It is the business of rapacious finning that has brought the shark kingdom to its knees (speaking proverbially), with great whites finally having been granted protection under the Endangered Species Act, but not yet added to the Endangered Species List. It is said that there are fewer than 400 left in the North Pacific, and maybe some 3,500 worldwide. See the incredible documentary Blue Water White Death for the first footage of great whites ever taken, and Sharkwater to learn about finning. And open your hearts and minds to the need for these wonderful animals to thrive at this point in our history! Visit Ocean Ramsey's website and please donate for their conservation.